Baraitser-Winter syndrome (BWS), first reported in 1988, is apparently due to genetic abnormalities that are still not well-defined, although many gene abnormalities are already discovered and de novo missense changes in the cytoplasmic actin-encoding genes (called ACTB and ACTG1) have been recently discovered. The syndrome combines facial and cerebral malformations. Facial malformations totally or partially present in the same patient are: Iris coloboma, bilateral ptosis, hypertelorism, broad nasal bridge, and prominent epicanthic folds. The various brain malformations are probably responsible for growth and mental retardation. To the best of our knowledge, the syndrome is very rare as few cases have been reported so far. Our aim was to describe a child with a phenotype that looks like BWS with proved partial growth hormone (GH) deficiency which was not reported before. A girl aged 7-year-old of consanguineous parents was referred for short stature and mental retardation. Clinical examination showed dwarfism and a delay in her mental development. Other clinical features included: Strabismus, epicanthic folds, broad nasal bridge, and brain anomalies such as lissencephaly, bilateral hygroma, and cerebral atrophy. Hormonal assessment showed partial GH deficiency without other endocrine disorders. Our case looks exactly like BWS. However, apart from facial and cerebral abnormalities, there is a partial GH deficiency which can explain the harmonious short stature. This case seems worth to be reported as it adds GH deficiency to the very rare syndrome. This syndrome with numerous malformations, also called cerebro-fronto-facial syndrome is responsible for facial and cerebral malformations ± other abnormalities. Facial abnormalities are iris coloboma, uni or bilateral ptosis, hypertelorism, broad nasal bridge, and prominent epicanthic folds. Numerous brain malformations are also described, that are related to an impaired neuronal migration. The most frequent seems to be microcephaly with gyral malformations that can be associated to other disorders. ,,, Cerebral malformations are probably responsible for short stature and mental retardation. Except for short stature endocrine function was not systematically assessed in the previous reported cases. We aimed to report the first case observed in our practice with partial growth hormone (GH) deficiency. A 7-year-old girl of consanguineous parents was sent to our department for short stature with mild mental retardation. Her family history was free of similar disorders. She was born at 38 weeks of a normal gestation. Her delivery was uneventful. Her birth weight and height were normal (respectively 3 kg and 52 cm). She did not have any problem till the age of 6 months when she developed repetitive apyretic seizures. 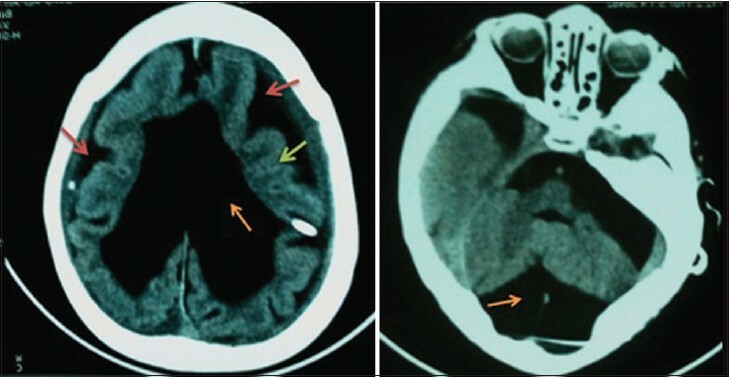 At that time, brain computed tomography (CT) scan demonstrated cerebral malformations. Her clinical examination showed an abnormal face with strabismus, a large forehead with high arched eyebrows, epicanthic folds, a broad nasal bridge, very thin lips and a short neck [Figure 1]. She weighed 15 kg and measured 1.01 m = −4 standard deviations. The lower/superior segment ratio = 1 which pleaded for a harmonious dwarfism. She also was described as having a mild delay in her mental development, but a precise psychological evaluation was not performed, and her stature curve was not available. Neurological examination was considered to be normal. Brain CT scan showed pachygyria with an abnormally smooth surface with fewer folds and grooves, and bilateral hygroma [Figure 2]. Standard analyzes were unremarkable, but GH assessment after insulin tolerance test showed partial GH deficiency [Table 1]. Other hormones were normal [Table 2]. Heart clinical examination and echocardiography were normal. Abdomen sonography did not show any abnormality, but ear nose and throat examination showed a conductive hearing loss. Ophthalmological examination noted a microphthalmia and refractive errors. Genetic screening was not done due to her parents' low socioeconomical conditions. As actins are ubiquitous and highly conserved proteins that are involved in various types of cell motility and maintenance of muscles and cytoskeleton,  genes' mutations may cause several abnormalities. Consequently, BWS combines numerous abnormalities including facial, neurological, bone, kidney, gynecologic, and heart malformations. Facial features are iris coloboma, congenital ptosis, high arched eyebrows, hypertelorism, broad nasal bridge, and epicanthic folds. Neurological malformations considered as major signs ,, include microcephaly, pachygyria or lissencephaly, and hydrocephaly. Dandy Walker malformation, lacking in our patient, was reported in some other cases. The aforementioned abnormalities are probably responsible for short stature with or without GH deficiency, intellectual disability, seizures, and hearing loss. Renal abnormalities such as horseshoe kidney and hydronephrosis, not found in our patient, are reported in other cases. Genital abnormalities have been documented in few patients. A broad chest, sternum or rib defects and scoliosis are also described as part of the syndrome. , Our patient did not carry any of these malformations. According to Abou Henedy postnatal short stature was observed in 75% of the reported cases. In our case, the very short postnatal stature is related to partial GH deficiency which can be explained by cerebral malformations plus hydrocephaly as we did not find any pituitary abnormality. Ocular coloboma can be found in many other disorders, such as Charge syndrome in which some heart abnormalities, choanal atresia, mental and/or somatic retardation, genital and ear abnormalities can be observed, but genetic abnormalities are different from BWS' ones. Baraitser-Winter syndrome functional and vital prognoses depend on the severity of cerebral malformations. Heart malformations and epileptic crises can worsen the poor prognosis. For treatment, there is not any specific one, but anti-epileptic drugs can help to decrease seizures 'frequency, and GH could be used to improve the final stature and prevent insulin-resistance and metabolic syndrome in adulthood. However, GH treatment is contraindicated in children with hydrocephalus (as in the reported case) and in some genetic diseases susceptible to develop malignancy. The reported case seems worth to be reported as it adds growth hormone deficiency to the numerous signs and symptoms of the very rare genetic syndrome first reported by Baraitser and Winter in 1988 which is apparently due to de novo mutations in the ACTB and ACTG1 genes. Baraitser M, Winter RM. Iris coloboma, ptosis, hypertelorism, and mental retardation: A new syndrome. J Med Genet 1988; 25: 41-3. 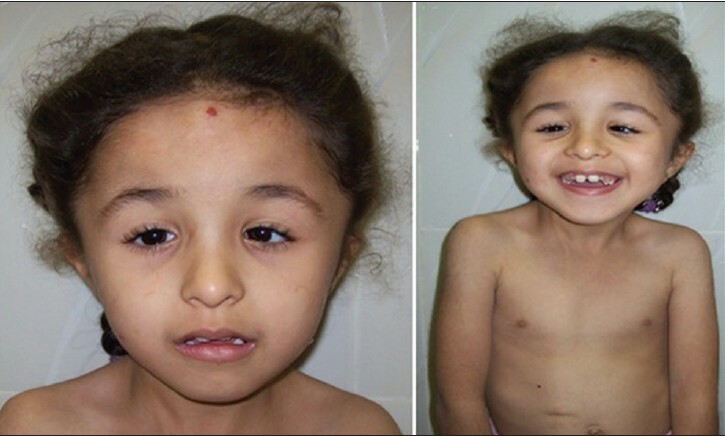 Eker HK, Derinkuyu BE, Ünal S, Masliah-Planchon J, Drunat S, Verloes A. Cerebro-fronto-facial syndrome type 3 with polymicrogyria: A clinical presentation of Baraitser-Winter syndrome. Eur J Med Genet 2014; 57:32-6. Rivière JB, van Bon BW, Hoischen A, Kholmanskikh SS, O′Roak BJ, Gilissen C, et al. De novo mutations in the actin genes ACTB and ACTG1 cause Baraitser-Winter syndrome. Nat Genet 2012; 44:440-4, S1. Di Donato N, Rump A, Koenig R, Der Kaloustian VM, Halal F, Sonntag K, et al. Severe forms of Baraitser-Winter syndrome are caused by ACTB mutations rather than ACTG1 mutations. Eur J Hum Genet 2014; 22:179-83. Johnston JJ, Wen KK, Keppler-Noreuil K, McKane M, Maiers JL, Greiner A, et al. Functional analysis of a de novo ACTB mutation in a patient with atypical Baraitser-Winter syndrome. Hum Mutat 2013; 34:1242-9. Ganesh A, Al-Kindi A, Jain R, Raeburn S. The phenotypic spectrum of baraitser-winter syndrome: A new case and review of literature. J AAPOS 2005; 9:604-6. Shiihara T, Maruyama K, Yamada Y, Nishimura A, Matsumoto N, Kato M, et al. A case of Baraitser-Winter syndrome with unusual brain MRI findings: Pachygyria, subcortical-band heterotopia, and periventricular heterotopia. Brain Dev 2010; 32:502-5. Rossi M, Guerrini R, Dobyns WB, Andria G, Winter RM. Characterization of brain malformations in the Baraitser-Winter syndrome and review of the literature. Neuropediatrics 2003; 34:287-92. Dominguez R, Holmes KC. Actin structure and function. Annu Rev Biophys 2011;40:169-86. Henedy MM, Marafie MJ, Abulhasan SJ. Baraitser-Winter syndrome: An additional Arab patient. Case report. Egypt J Med Hum Genet 2010;11 (2):187-91. Winter RM, Baraitser M, Douglas JM. A computerised data base for the diagnosis of rare dysmorphic syndromes. J Med Genet 1984;21:121-3.